Tubular Cable Conveyor transfers food, non-food products. Available in unlimited configurations,, FLEXI-DISC™ Tubular Cable Conveyors move material using high-strength polymer discs, affixed toÂ stainless steel or galvanized cable, that slide within smooth stainless steel tubing. Fragile productsÂ can beÂ moved gently, quietly, and without dust horizontally, vertically, or at any angle through small holes in walls or ceilings. Able to convey over short distances or hundreds of feet, system can also have single or multiple inlets and outlets. BETHLEHEM, PA — An all-new FLEXI-DISC™ line of Tubular Cable Conveyors for the gentle transfer of friable food and non-food products has been introduced by Flexicon Corporation, it was announced by David Gill, president. "The new tubular cable conveyor is a strategic addition that complements Flexicon's established line of flexible screw conveyors and pneumatic conveying systems, allowing us to now convey virtually any bulk solid material in the most efficient manner possible," says Gill, adding, "Flexicon has engineered and thoroughly tested the new conveyor over several years to significantly advance the technology and performance associated with this conveying method." The conveyor moves material using high-strength polymer discs––affixed to a stainless steel or galvanized cable––that slide within smooth stainless steel tubing, moving fragile products gently, quietly and dust-free, horizontally, vertically or at any angle, through small holes in walls or ceilings. The system can have single or multiple inlets and outlets, and convey over short distances or hundreds of feet/meters. Gentle handling offered by the conveyor makes it suitable for food products that are prone to breakage or degradation including: cereals, coffees, teas, dried fruits, frozen vegetables, grains, nuts, peas, pet foods, seeds, snack foods and spices. Typical non-food applications include bulk chemicals, minerals, chopped fiberglass, microspheres, regrind, pellets, tobacco and other friable materials. Modular system components in 304 or 316 stainless steel include tubing, drive wheel housings, tension wheel housings, metered and non-metered inlets, and discharges with and without valves, as well as accessories for wet or dry cleaning, including CIP sanitizing. Available in unlimited configurations, the conveyor is offered as a stand-alone system, or fully integrated with upstream and downstream equipment such as inlet hoppers, bag dump stations, bulk bag dischargers, bulk bag fillers, drum/box/container dumpers, weigh batching/blending systems, screeners, filling machines and storage vessels manufactured by Flexicon and others. Free testing using supplied materials is offered at Flexicon test laboratories on full-scale Tubular Cable Conveyors and upstream equipment that simulate customer processes. 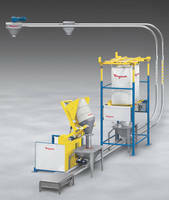 Tubular Drag Conveyor combines both chain/disc technology. Flexible Chain Conveyor transfers parts as small as 3 in. Automatic Rope Tensioner suits aero-mechanical conveyors.